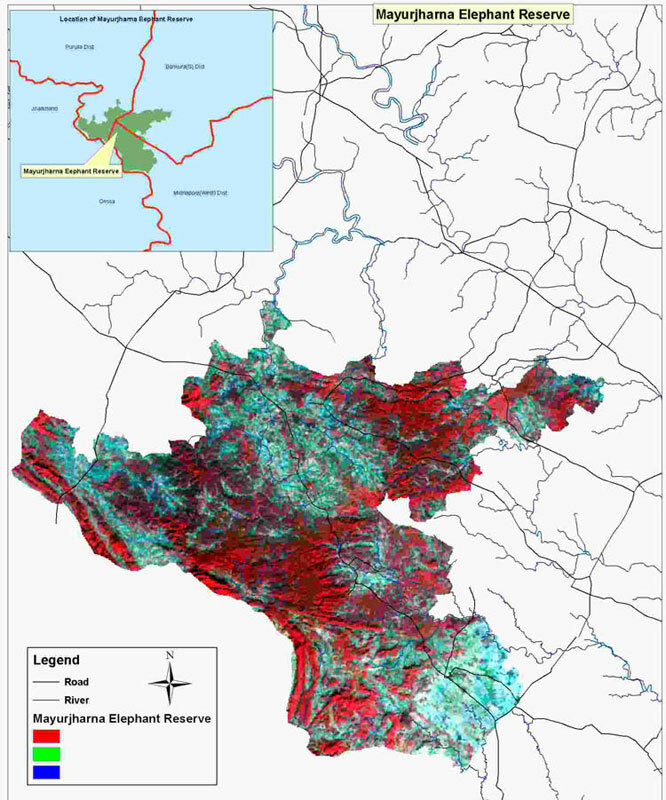 Whereas the area whose situation and boundaries are described in the Schedule below (here-in-after referred to as the said area) is considered to be of adequate ecological, and floral signification for the purpose of protecting containing Wildlife (Elephant) within the Forest for the main purpose of conservation of Elephants.And whereas the said area is constituted of Protected Forests, after careful consideration itis proposed to establish an Elephant Reserve under the Central Scheme Project Elephant.And whereas Govt. of India vide their letter No. 7-2/00(PE) dated 25 th July, 2001 have communicated their consent for establishment of an Elephant Reserve in the name of "Mayurjharna Elephant Reserve" comprising the said territory.Now, therefore, the Governor is pleased to declare the area described in the schedule below as "Mayurjharna Elephant Reserve" under the Central Scheme of Project Elephant. District : Portion of Midnapore, Bankura, and Purulia Distt. Latitude : North 23'-27" and 22'-23"
Longitude : East 86'-27" and 87'-32"
Bankura (South) DivisionName : Mayurjharna Elephant ReserveArea : 414 Sq. Km. South : Binpur Block of Midnapore and Raipur Block of BankuraThe area comprising 414 Sq. Km. consists of Kankrajhore, Mayurjharna, Banspahari and Bhulabheda Forest Blocks of West Midnapore Division (area 131.50 Sq.Kms.) and Popo, Barudi, Quilapal (P) etc. Forest Blocks (area 88.50 Sq.Kms.) of Kangsabati Soil Conservation - II, Searbinda, Udalchua, Jalpukuria and Belpahari Forest Blocks (area 64.56 Sq.Kms.) of West Midnapore Division and Quilapal (P), Nanna, Dhadka and Quchipara Forest Blocks (area 38 Sq.Kms.) of Kangsabati Soil Conservation Division - II and Ranibundh, Motgoda (P), Chendopathar, etc. Forest Blocks (area 91.50 Sq.Kms.) of Bankura (South) Division. Lalgarh, Modnapore, Arabari, Godapiasal, Nayabasal forests of East Midnapore Division, Garbeta, Hoomgarh, Goaltore forests of Rupnarayan Survey and Planning Division, Sonamukhi forest of Bankura (North) Division, Bishnupur, Joypur or Panchet Soil Conservation Division, Motogoda, Taldanga (P), Sarenga Forests of Bankura (South) Division including Agricultural and homestead land adjoining the above divisions.It is however pointed out that the intention and purpose of declaration of Elephant Reserve is for undertaking various developmental activities and improved measures in the home range of migratory and resident elephant primarily within the state forests as mentioned under schedule of area and for containing the elephants within the forest area with sole idea of reducing man-elephant conflict and degradation there off without exercising any regulatory control of the Wildlife (Protection) Act 1972 (as amended upto 1991) on the declared Elephant Reserve.